Comic book and animation writer Dwayne McDuffie, 49, dies. 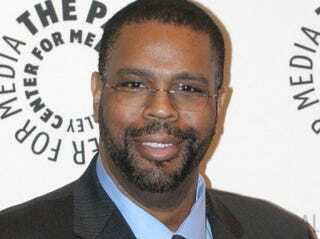 EURrweb is reporting that revered comic book and animation writer Dwayne McDuffie has passed away. The Detroit native died Monday, a day after his birthday, DC Comics said. He reportedly passed away because of complications following a surgical procedure he underwent Monday evening. McDuffie wrote comics for the New York-based DC and Marvel — including runs on Batman: Legends of the Dark Knight, The Fantastic Four and The Justice League of America — and founded his own publishing company before crossing over to television and animation. He also penned several animated television shows and features, including the just-released All-Star Superman as well as Justice League: Crisis on Two Earths and the animated TV series Static Shock and Ben 10: Alien Force. McDuffie tweeted last week that he was "Taking a break from a script I owe to attend the LA premiere of 'All-Star Superman.' " He was 49. In other news: Mom Lashes Out at 'Cash for Kids' Judge.